Now that we're getting settled into the new place, we're trying to do better about grocery shopping at the beginning of the week and eating most meals at home. I've got a good system of checking the sale folders for good deals and shopping off of a list. It's still a work in progress, because then I get the food home and don't have any meals planned out for it. Which reminds me, I forgot to take something out of the freezer this morning. Ugh. Like I said, it's a work in progress! One of my personal goals is to eat breakfast at home every day. I had started doing this back in Quincy a while ago but fell off the wagon when I was going back and forth between Quincy and Canton so much. We do have a cafeteria at work, but it gets expensive eating breakfast there every day, plus it's usually greasy home fries and two fried eggs. I could order a veggie scramble, but I don't. Ever. At home I always eat healthier. 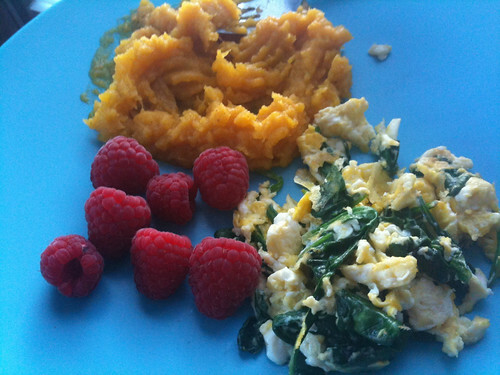 This morning I had one egg scrambled with spinach, some leftover butternut squash from last night's dinner, and some raspberries. B gets up really early to take Roddy out for his first walk of the day which is good because it makes me get up earlier too which leaves more time to watch a little Good Morning America and eat my breakfast with Roddy before we take his second walk of the day just before I leave for work. I'm telling you guys, life is good these days! I'm loving this new part of my life, it's a lot of fun and I couldn't be happier with my little family. I <3 Roddy! 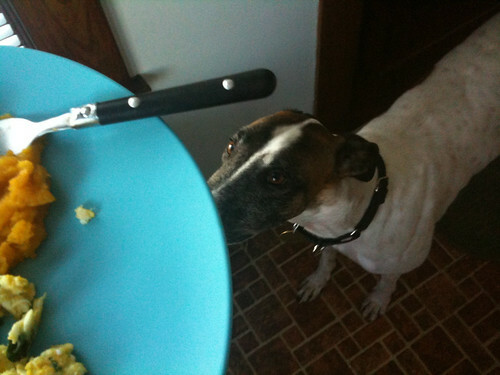 My greyhound gives me that same pleading look. :) Glad you're settling in and getting back into your healthy eating routine! I usually will pack a healthy breakfast and eat it at work! I like my morning routine of grabbing coffee, eating at my desk, and then jumping into the workday. I'll be posting a series of healthy breakfast, lunch, dinner, and snack ideas soon - starting next Monday - so maybe some of these will help you out as you guys continue to get settled!